The Veterans’ Guitar Project—Austin was inspired by our 2013 concert. Ten veterans studied the instrument with Kim and performed on the concert with Kim, Ben, and our special guest Kirby Kelley. 2013-14 classes are offered free of charge for veterans in the Austin, TX area. All levels of playing and styles welcome. Please visit our page on this site “Veterans’ Guitar Project— Austin”. The Wounded Warrior Project (WWP) is a veteran-run non-profit organization that assists our service men and women in their transition back to civilian life. 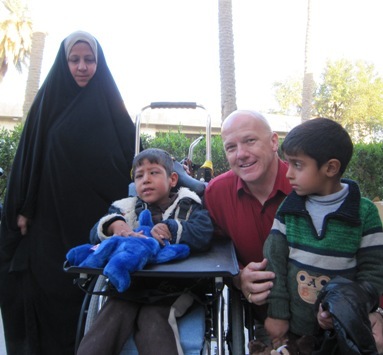 Wheelchairs for Iraqi Kids was founded by Texan Brad Blauser in 2005 to meet the needs of children with disabilities in Northern Iraq at the request of LTC David Brown. He and his soldiers had been in the city of Mosul and observed as children pulled themselves along the ground because their legs simply did not work. Brad was in Iraq as an independent contractor when he saw this need and changed his life to fill it. 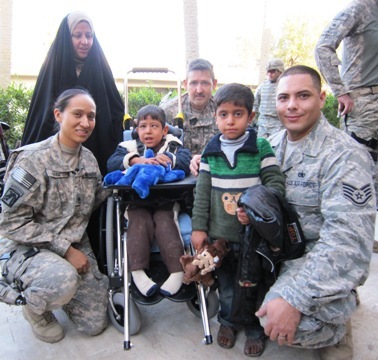 With the assistance of our troops, Brad personally delivers these wheelchairs to children living in Iraq. 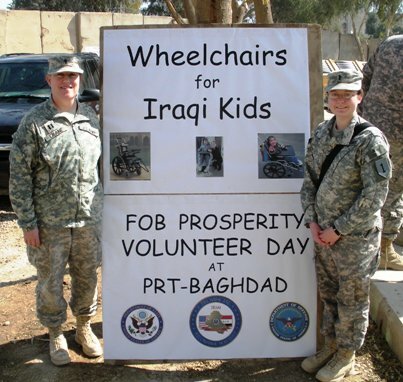 Since that time, over 834 high quality pediatric wheelchairs have been provided by generous donors and delivered to these children by soldiers serving in Iraq.Brad’s Non-profit partner – ROC Wheels (Reach Out and Care), designs the wheelchairs specifically for children in developing countries with rough terrains. The cost of each wheelchair is $350.00. To date, Brad has raised $2.5 million dollars to help these children. In 2009, Brad was honored by CNN as a “Top CNN Hero”. Recently, the Iraqi government’s Ministry of Health took over the project in that country. Brad continued his work with ROC, helping the children of Kurdistan and renamed his project “Wheelchairs for Kurdistan Kids”. Brad’s project wrapped up in 2013 and he moved back to his native Texas. His new, exciting charity project is a continuation of his mission to provide wheelchairs to kids who need them. Watch Brad’s CNN Honoree video here. Please indicate which charity you would like to support, and Ben will send the funds. All donations are tax deductible.